In other words, socks are the ultimate in minimalist footwear, and shoes that aim to follow the “minimalist” model get the wearer as close to going barefoot as possible. A simple style that fits in anywhere, from the course to the concourse. The original TRUE Tours did this exceedingly well. Ridiculed by some for looking like “clown shoes,” golfers far and wide fell in love with the supreme comfort the Tours offered. 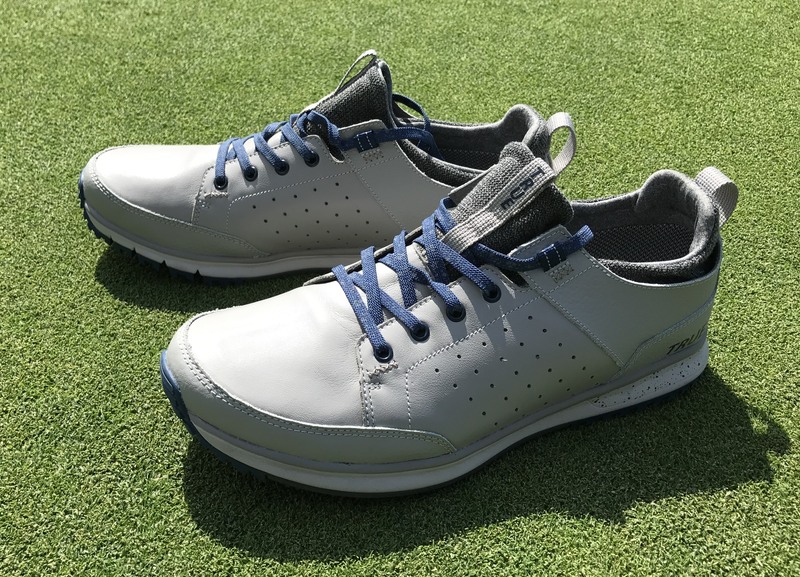 Other golf shoes at the time, after all, were anything but minimalist: they were heavy, stiff, cleated, and had a bunch of arch support and heel lift. To the delight of a new-found market, TRUE’s Sensei and the Stealth continued the minimalist trend, and were great shoes too. Then, things changed. I’m not going to re-hash everything, but suffice to say that the shoes TRUE produced after the initial three or four models were increasingly far away from the original in style, function, and purpose. They narrowed toe boxes. They increased sole thickness. They raised heel drop. They added structure. Support. Weight. For goodness sake, they even added cleats to several of their shoes. The toe “scuff plate” protects the toe area if you’re a dragger. Again, without getting into the details, much of the original TRUE team has re-secured control of the company, and are getting back to their roots. PGA Tour winner Ryan Moore (and his brothers) are once again very well heard within the company, and the minimalist ideals are being expressed and embraced once again. The Outsider checks off all of the minimalist checkboxes. Weighing in at only 13.1 ounces, the Outsider is lightweight. For a leather shoe, that’s rather good. Much of the lightweight nature comes from the EVA midsole, which cushions gently without detracting from the natural, minimalist feel. The EVA midsole insert is comfortable, breathable, and anti-microbial, so you can leave your shoes in the car without worrying about the funk. 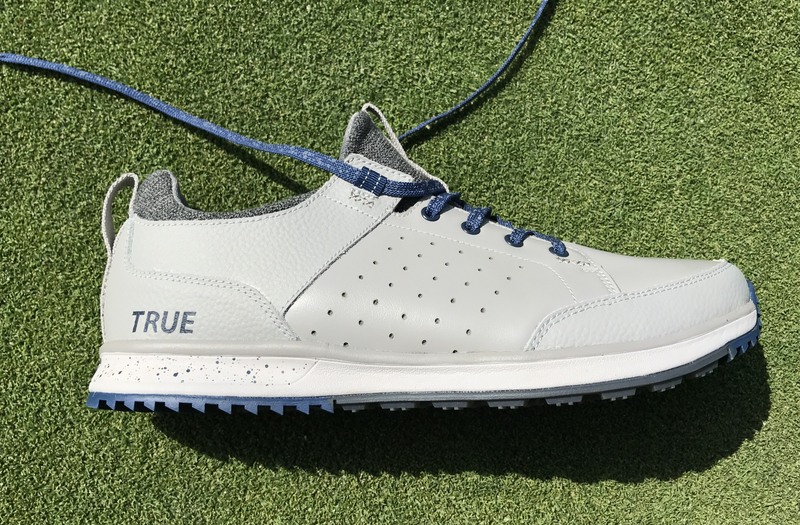 TRUE touts the leather upper as “Prime Asia Full Grain Premium Waterproof leather and says this provides “the ultimate in quality, durability, comfort and eco-friendly practices. All I can tell you is that the leather is breathable, waterproof, and soft right out of the box. It’s flexible and conforms to your movement. TRUE is so confident in the waterproofing on the Outsider that they’re offering a two-year guarantee (and they stand by their guarantees, unlike other companies who will exploit any loophole possible). The inner liner is the super-comfy “SockFit” liner style, a stretchy, breathable, lightweight liner that conforms to your feet and fits like, well, a comfortable pair of socks. 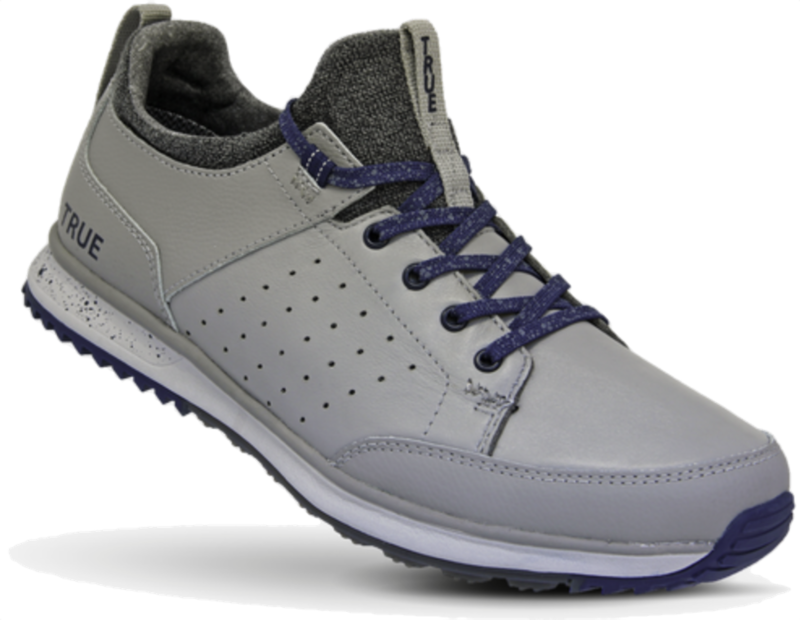 The sole features what TRUE Linkswear calls their “Cross-Life Tread” for maximum versatility, on the course or on the pavement of your city streets, the gravel of your neighborhood playground, or the carpet in your local movie theater. 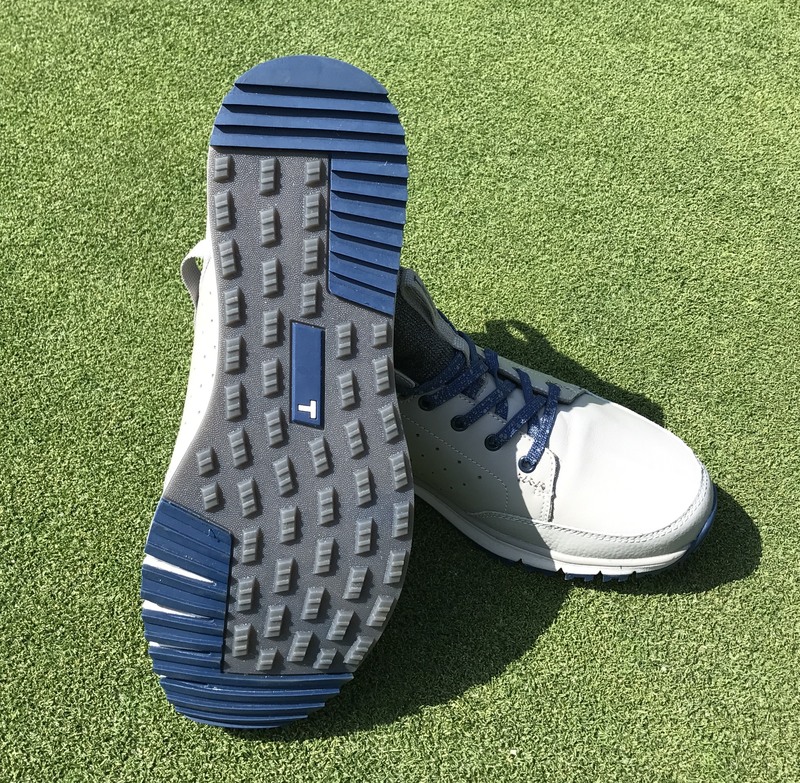 Finally, yes, the “natural width” toe box makes its return, freeing crowded little piggies from the confines of the pointy toe boxes found on dress shoes and most other golf shoes. As to how they look, well, both the Original and the Outsider feature a fresh look that, to my untrained fashion eye, look nothing like the “clown shoes” of the original Tours. (If you read the original review, you’ll note that I actually liked the look of the originals. Style is individual.) The Outsider in particular is touted as being a “go everywhere” style shoe, and I can see it. It’s a hybrid look that blends a little bit of “sneaker” with a little bit of the classic golf shoe. The holes on the side offer breathability and a little bit of a retro look, while the SockFit liner in a slightly contrasting color and the laces that match the sole look really sharp. The sole features flecks of color for interest, and the “TRUE” branding is kept to a minimum – in fact, I am a bit surprised not to see the “T” logo featured a bit more prominently. Outsiders are available in Grey/Navy, Whiteout, and Classic Black. If you ask my wife (please don’t), she’ll tell you how I’m not the guy to go to for fashion advice. My closet consists of a pair of jeans, super comfortable t-shirts dating back as far as 1993 (yes…), and a bunch of polo shirts and grey golf pants. I’m a big fan of function over form, and keep things pretty simple on the fashion front. Style is individual, and so that’s all a long way of saying that you can (and probably already have) judge the style of these shoes for yourself. The Outsider is available in three color ways: Grey/Navy, Whiteout, and Classic Black. It is available in half-sizes from 7 to 12.5 as well as sizes 13, 14, and 15. The cost is $169. The heel is the only place you’ll find the TRUE Linkswear “T” logo. There’s just something about a great feeling pair of shoes. You slip them on, tie the laces, take a few steps, and the shoe just melts away. I have some army buddies, and to a man one of the things they said they learned was to take care of their boots, because if you take care of your boots, they’ll take care of your feet. Within the context of first-world golfer problems, few things stink more than having sore feet at the end of a round, blisters, or crowded toes. The Outsider after about a month of wear in the address position. 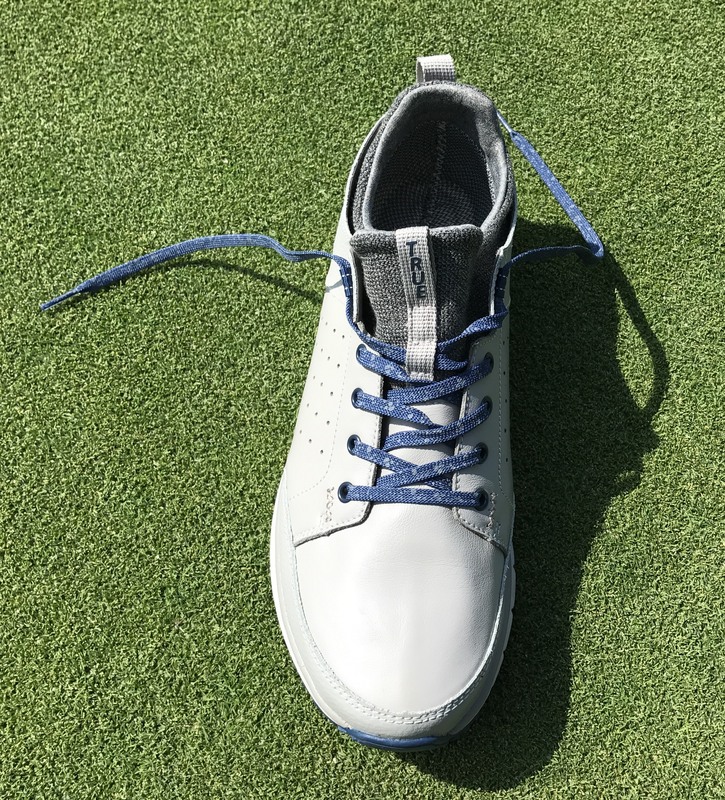 The Outsider harkens back to the TRUE Tour, from the SockFit liner to the wider toe box, and the instant, out-of-the-box 36-hole comfort. 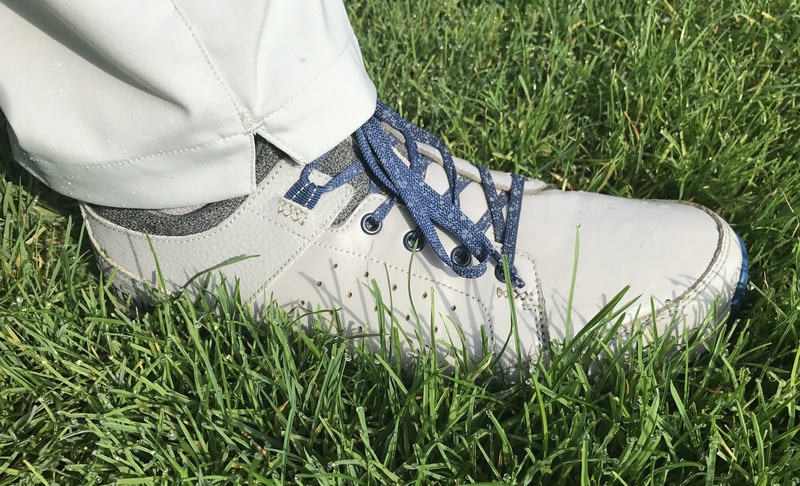 Upon receiving my Outsiders, I took them out of the box and put them to the test, immediately: I wore them while walking around about 30 holes watching my collegiate players. They passed the test with flying colors. After paying attention to them heavily the first few holes, I quickly forgot about them. The fact that I was wearing brand new shoes faded into the background. I didn’t notice them at all. They didn’t rub me the wrong way. Nothing poked me. The laces didn’t untie or need adjusting. I didn’t get a blister. My feet weren’t hot and sweaty, and I wasn’t pinched at any point. The course was wet that first day, and my feet remained dry. Wet grass is no match for the two-year waterproof guarantee. And nothing has changed since that first day. Every time I slip on the Outsiders, I forget that I’m wearing golf shoes after a few minutes. They just fit, let my feet function the way they were intended, and feel great. On the golf course actually playing golf, the shoes perform just as admirably. TRUE touts them as having 36-hole comfort, and that holds up. I’ve worn these in downpours. I’ve worn them on muggy, still, hot days. My feet stay dry, cool, and comfortable throughout. The sole features “Cross-Life” tread for any activity. 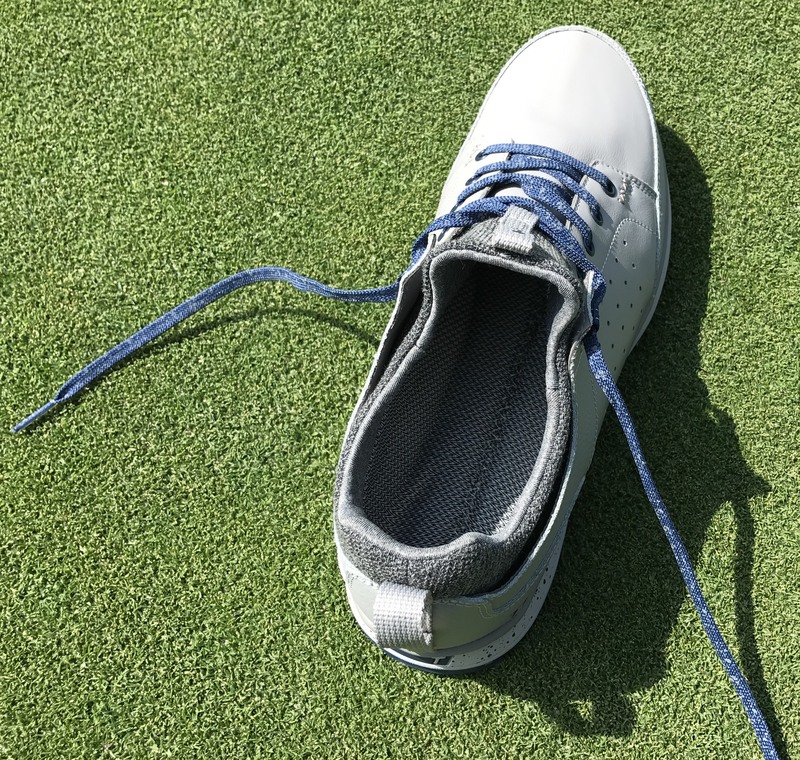 With a spikeless shoe, traction is often a concern. Let me allay your fears and say that I’ve been wearing spikeless shoes almost exclusively for almost a decade, and that these perform as well as any other I’ve used. Do they offer the grip of a plastic cleated shoe? No – but even plastic cleats will slip when they can’t dig in to hardpan or wet wood. The Outsiders performed as well as or better, in a variety of conditions, as I could expect. I had confidence walking up some rather steep, wet slopes, taking wooden or polished steps two at a time, and in general felt that traction was never an issue. I could swing out of my shoes – not that I would want to! – and the TRUEs would grip the ground throughout. The soles may be the only slightly disappointing thing about the Outsider, but not from a traction standpoint. One of the things I loved the most about the original TRUEs were the super-thin soles that let you feel the ground. With the Outsider, TRUE has bumped the heel drop to 4mm (still within range of “minimalist” shoes), and the connection between your feet and the ground has been lessened ever so slightly. If you loved using AimPoint with your original TRUE Tours, you’ll find the sensation is just a bit dampened in the Outsiders. 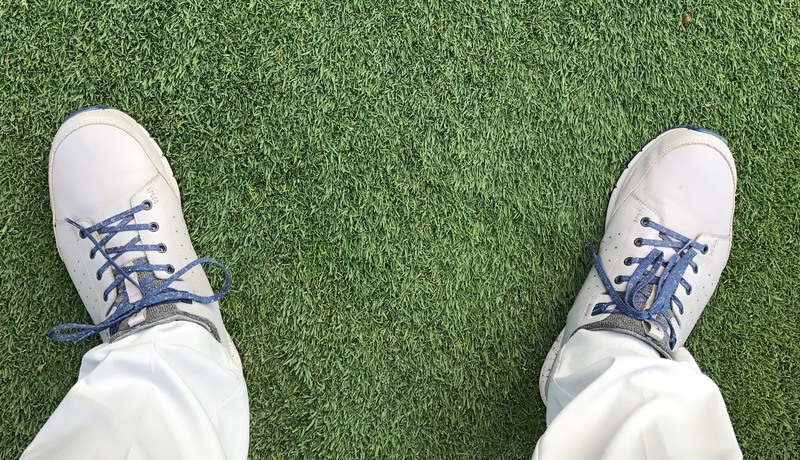 For most golfers, this is actually a welcome change, and I fully acknowledge my own level of weirdness in preferring very minimal cushioning and a very thin sole that lets me feel the ground beneath my feet. I liken it to the stiffer suspension in BMWs – some drivers like to “feel the road” and others – most – like to have a bit more of a cushioned ride. One last note, and I apologize for how awkward this may feel just kind of stuck in here without a segue or anything… but my college kids played a tournament with some sort of heavy clay soil and some dust that stained many of their shoes a reddish brown. My grey/navy Outsiders were coated in the stuff at the end of the day, but unlike their shoes, many of which seemed to absorb the dust, mine wiped off. I don’t know if that’s a function of the leather versus the fabric/leather combo on many of their shoes, or the waterproofing, or what, but I was glad that the shoes resisted staining. Long story short, these are the best feeling golf shoes I’ve worn since the original TRUE Tours. To TRUE fans, that will tell you all you need to know. To those new to TRUE, or curious about them, let me put it this way: TRUE offers a 30-day trial. Take advantage of that. Just order about half a size smaller than usual? I wear a size 11 in regular shoes and a 10.5 fits well in the Outsider. 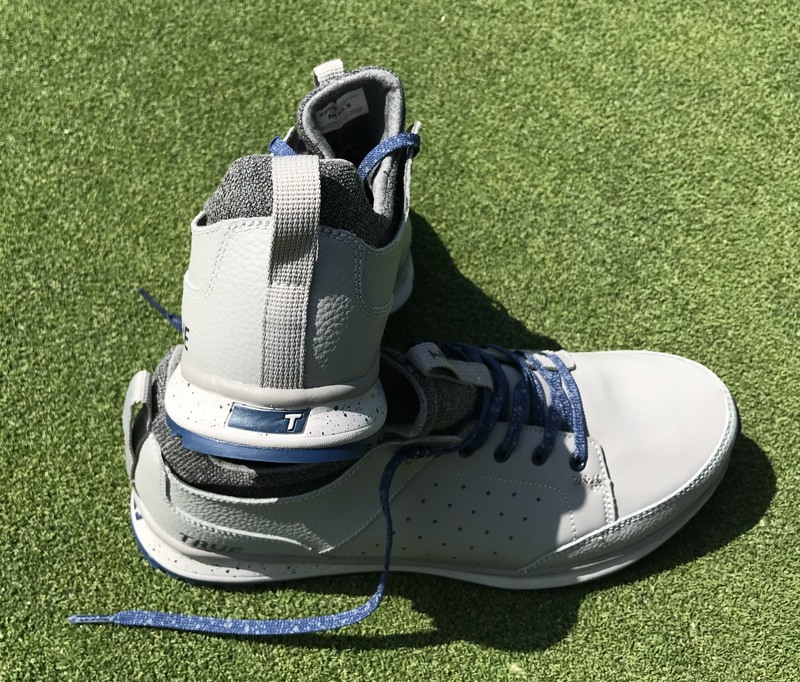 (TRUE fans, these fit like the original Tours, and about half a size smaller than the Elements Pro or many of the 2015 through early 2017 TRUE models). TRUE fans have been waiting for a “true” successor to the Tour, and with the Outsider and the Original, they’ve finally arrived. 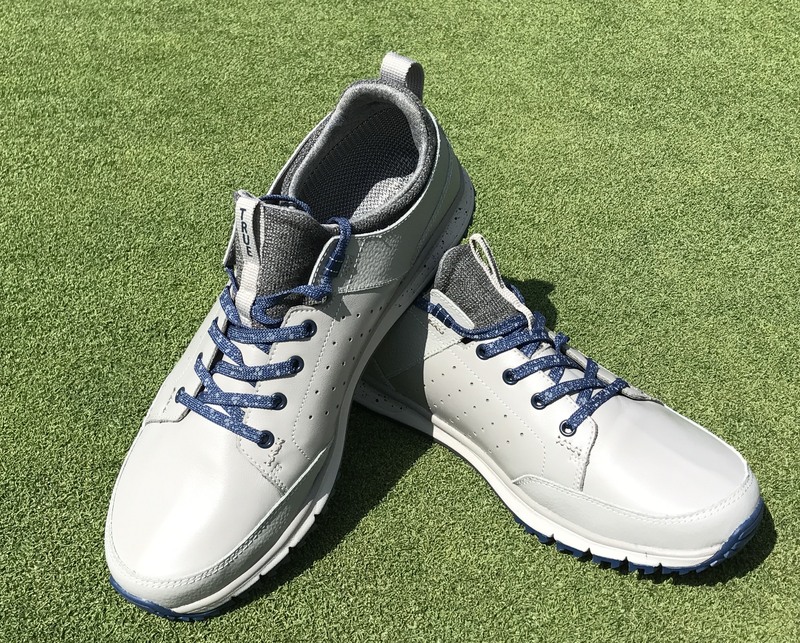 With an updated, fresh look that will fit into almost any situation on the golf course or off, the TRUE Outsider is an incredibly comfortable, waterproof, stylish, and functional spikeless shoe. 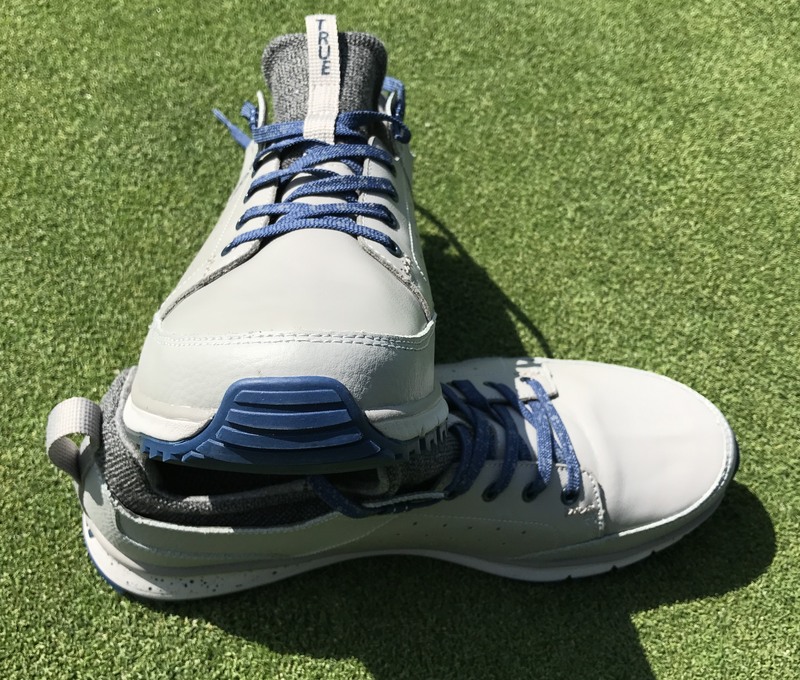 The Outisder will delight long-time minimalist fans as well as to surprise those who have yet to experience all-day comfort from a lightweight, flexible, breathable shoe. Cast off your rigid, “foamy,” cramped toe shoes. Step – with comfort – into the 21st century. Let your feet function the way they were intended, and as TRUE says in their marketing materials, “enjoy the walk” for once. With a 30-day trial and a two-year waterproof guarantee, you can’t go wrong. Buy yourself a pair (or three!) of the TRUE Outsider today. Wow-These shoes sound like the real deal. I am excited to receive the two pair I ordered-I went all Henry Ford and got one each both in black. Do you think that TRUE has finally righted the ship?-Some of the other shoes they made were not good. My Tours wore through in the sole I wore them so much. Been wearing True’s since the beginning. As you mentioned the last few years were a disappointment (to put it mildly). To their credit True backed up thei product and always honored their warranty. The new models are amazing. True finally figured it out and we now have True feeling AND stylish looks. For the first time since the True Sensei I feel comfortable in a golf shoe again . If you are a former True fan who gave up on them I highly recommend you give them another chance. This shoe is what we were always waiting for. I’ve tried on all the other non traditional golf shoes. Nothing on the market fits or feels like these. I’m thrilled True has finally found their way again. I am hating this trend for gold shoes to look like trainers. I don’t doubt it is comfy but while the shoes are progressing we are still forced to dress like the 1940’s so what is the point??? You look ridiculous with trainers on and the grandpa look.. Sorry, Gio, I don’t see it. The shoes look like a nice blend of classic and modern to me. If you mean they look a bit too much like sneakers, well, they look a lot less like sneakers or “tennis shoes” than a lot of other shoes on the market today. Use code TRUEDEAL15 for 15% off your order at true linkswear.com.